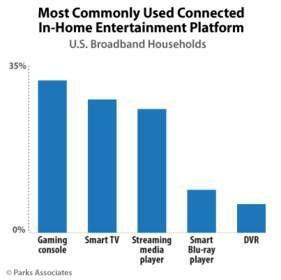 DALLAS, TX--(Marketwired - Sep 27, 2016) - A new industry report from Parks Associates finds that 73% of U.S. broadband households connect one or more in-home entertainment devices to the Internet, an increase of 11% from the beginning of 2015. Streaming Media Devices: Trends and Innovation examines this growing market, which includes smart TVs, gaming consoles, streaming media players, Blu-ray players, and digital video recorders (DVRs). "Consumers continue to accumulate streaming options for homes, including smart TVs, which are on track to surpass connected gaming consoles as the primary streaming tool in the home," said Barbara Kraus, Director of Research, Parks Associates. "People aren't buying TVs solely for the smart functionality but within the standard replacement cycle, and those new TVs are likely to be smart. New owners of smart TVs will try out the smart functionality in the new TV and continue to use it if it meets expectations." "Companies such as Intel and ASUS introduced new computer sticks in 2015 as streaming devices with value-added computing capabilities, but users firmly stick with the streaming use case," Kraus said. "Among owners of a computer stick, 60% use it for streaming, compared to only 24% who use the stick as a computer." Streaming Media Devices: Trends and Innovations focuses on market innovations and trends within the ecosystem for connected TV home entertainment devices. It includes five-year forecasts of unit sales for each connected device. The report is available to purchase at www.parksassociates.com.